Life just got a little bit easier for all of the holster makers out there thanks to the team at Holster Builder! As you might know, first we were shooters, then we were holster makers, and now we want to help you succeed. Although it’s kind of hard to believe, the fact of the matter is that the holidays are already right around the corner. That means many different things to many different people, but to those who are building holsters, it means you’ll need inventory. The reason for this, of course, is because the holidays are popular times for friends and family to give their loved ones holsters as gifts. That means that you’ll need to be ready to provide your customers with exactly what they’re looking for. Not to worry though, because we have all of the holster making supplies you need! For many, one of the crucial components of holster building is Kydex sheets. The good news is that we have plenty of options to choose from. In other words, no matter what type of holsters you like to build or who your target audience is, you’re sure to find that we have something for pretty much everyone. From digital camo to black multicam to desert to hexcam, we proudly offer plenty of camo patterns to choose from. No matter the look you’re going for, a unique camo print is sure to provide it. When you need something simple and no-frills, but you don’t want to opt for a solid color, carbon fiber provides you with just the look you need. It’s classic (and classy) and it’s available in colors ranging from coyote brown to EMT red to safety orange. The wonderful thing about solid colors is that they’ll never go out of style. After all, who doesn’t love a classic black holster? Fortunately we offer a variety of colors, and you can even get a mixed 12 pack of Kydex sheets if you choose. Let’s say you want to add a little something special to your holster. If that’s the case, textured prints are the way to go. From basket weave patterns to suede textures to a fabric look, textured Kydex offers you a little something out of the ordinary. When you need your holster to make a statement, a specialty print is the only choice. Whether it’s a print of the Constitution, an American flag, the Punisher logo, or something else, a specialty print is worth a thousand words. What Makes Us One of the Top Kydex Holster Suppliers? 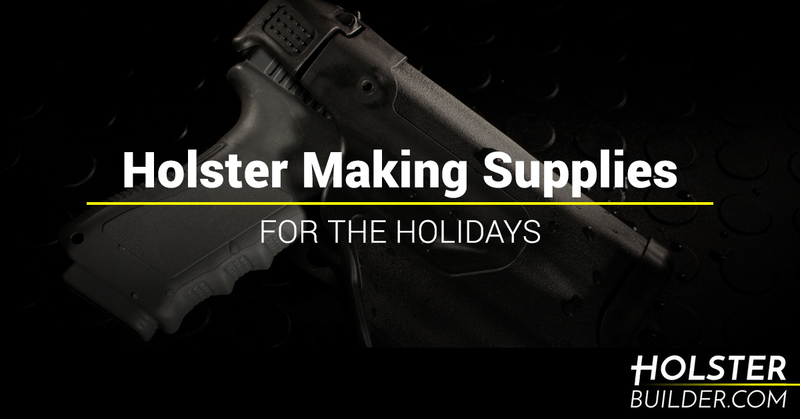 When it comes to holster making supplies, you can count on holster builder to have everything you need. From materials to supplies to belt attachments and more, we offer a wide variety of different options to ensure that no matter what your vision is for a holster, you can make it without a hitch. Take a look around our website and place your order today to start preparing for holiday orders now.